Grittier and more glamorous than ever before, this brand-new production is direct from a sell-out and critically acclaimed run at Leicester Curve. Directed by Curve’s Artistic Director Nikolai Foster and starring very special guest artist – Peter Andre as Teen Angel* – reignite your passion and get ready for an explosion of summer loving. *Please note: Peter Andre will appear in performances from 24 - 28 September only. 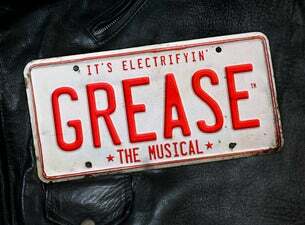 The No.1 party musical Grease is truly electrifyin'! Since the show’s Broadway premiere in 1972 and the 1978 hit movie starring John Travolta and Olivia Newton-John – which went on to become the highest grossing movie-musical of all time – Grease has triumphed across the globe, with its irresistible mix of unforgettable songs, dazzling dancemoves, and 1950s pop culture. Festival Productions presents a show bursting with energy and colour, with stylish choreography and of course with all those legendary songs from the movie, including Summer Nights, Sandy, Hopelessly Devoted to You, You’re The One That I Want, Greased Lightnin’, and Grease is the Word. So dust off your leather jackets, pull on your bobby sox, and take a trip to Rydell High, where the T-Birds and the Pink Ladies promise an electrifying show that will make you want to stand up and shout A-wop-bop-a-loo-bop A-wop-bam-boom!